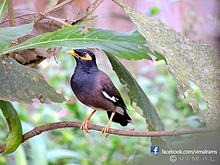 A Common Mynah, hanging out on a tree. When I was a teenager, I began buying science fiction magazines. The magazines would sometimes serialize a novel over two or three issues, and when they did so, they would run a synopsis in the later issues, to help out any readers who had missed the earlier part of the novel. Dell originally published Illuminatus! as three separate mass market paperbacks, and so the second and third paperbacks had synopses for those who had missed the earlier books. These were omitted when Dell put out the one volume omnibus, which is the format that has kept Illuminatus! in print over the years. This must have made sense to Dell's editors, but I enjoy the synopses every time I read them, and I noticed that the prologue for The Golden Apple is the only place that really tells the full story of the self-destructing mynah birds. I mentioned that to Robert Shea when I met him for the first and only time, at a worldcon in Boston, Noreascon 3 in 1989, and he said that he and RAW had been unable to convince Dell that the synopses were little literary works in and of themselves. Brilliant anecdote Tom. I'm looking forward to reading it again soon. And yes I think if they were in the combined edition it might make the story a little less confusing :P I need to get around to reading The Island by Aldous Huxley as well to enjoy the self-destruct Mynah bird joke even more. I used to love the Travis McGee books. I enjoyed rereading the summary. I find it interesting how some books I used to think of as trilogies I now tend to think of as single works, such as Illuminatus! and The Lord of the Rings. Since I now usually read those two books in one volume paperbacks, I tend to think of them more as unified novels than I used to last century. I wonder how reading on Kindle might shape one's notions about such works. I commented on this synopsis when Tom first posted the link to it back in week 17 if my memory is correct. However, my experience with Illuminatus! is that something new gets discovered with each reading. "Self-Destruct Mynah Bird" = 106 = both "attained" and "death" ( by the gematria in 777) which could indicate death of the ego. 106 also relates to the classic Tibetan bardo line" "maintain the thread of consciousness." " the secret weapon is Anthrax Leprosy Pi (ALP)" - the mention of a secret weapon here connects with its mention again toward the end. Both ALP and neuroprogramming the sixth circuit = the secret weapon. One translation of Anna Livia Plurabelle (ALP from Finnegans Wake) could be "Unity Live Much beauty. Beauty = the English translation of Tiphareth, the 6th trip that we're about to enter in Illuminatus! Tiphareth = the Sephiroth of the sun. The letter "r" corresponds with the Sun card in the tarot. Going up the middle pillar on the Tree of Life from Tiphareth to Kether puts us on the path of Gimel which = camel. This path crosses the Abyss. Carmel (the character) = camel with an extra "r" perhaps indicating a location at the Tiphareth side of Gimel. The paragraph that starts: "Carmel, indeed, is convinced that Sherri’s latest john, Charlie Mocenigo, has discovered the ultimate secret weapon." later has the phrase: "the world is dancing on the edge of an abyss"
The Abyss often gets compared to a desert. It makes sense that the path that goes through = camel. Carmel lives in Las Vegas located in the middle of a desert. “To reveal everything is an ineptness,” Hagbard Celine remonstrates" It's also considered unprofessional because it steals the work people have to do to find out for themselves. We are between ch.5 and 6, which indicates the path of Lamed which = the tarot card Justice so we get several references to law, lawyers and court here. Crowley renamed the card Adjustment and says it represents "The Woman Satisfied" and we see at least one quick reference to her in this synopsis. Reading about this card in The Book of Thoth will show more congruencies. There appears a reference to "waking up" altering the perceived flow of time. "And the White House order is given; the SAC bombers head toward Fernando Poo and the Third World War... "
This is a very interesting sentence and reveals the author(s) as adepts in practice as well as theory. Actually, this whole section does, some of the most brilliant writing I've seen regarding the hermetic path of transformation. In Regardie's book "The Tree of Life" he says that the task of the aspirant after realizing the Knowledge and Conversation of the Holy Guardian Angel (which occurs in Tiphareth) is to confront and subdue the four Princes of Evil, one from each quarter. This terminology seems rather medieval, I see it in Jungian lingo of confronting and learning how to live with the Shadow. "Who knows what evil lurks in the hearts of men?..." muhaha. Tiphareth truly belongs in the center because from there the aspirant can see and experience the Highest and the Lowest which can feel psychotic when it gets intense. SAC = Strategic Air Command, in magick a reference to the strategy of dealing with this situation and going forward. (Look up the meaning of Las Vegas for another kind of strategy) Also, SAC = 69 a number that could get interpreted to indicate this reversal of perception between high and low. Looking ahead at the first page of the next chapter we find a sentence analog to 69. I'll comment more about that when we get there. The nature of the "lowest" as well as the kind of obstacles the aspirant faces crossing the Abyss gets strongly hinted at all through this summary particularly toward the end, as well as the subtitle to the next chapter. in relation to this synopsis and my comments. The reference to 2001 A Space Odyssey also seems most relevant to our tale.